Open education is about the way people produce, insight, share, and build on knowledge in an open learning environment. Proponents of open education believe that high-quality educational resources and practical experiences of higher qualified specialists should be freely available for everyone. However, they neglect two important drivers: Cartesian view and social learning. In the context of the other chapters of this book, it appeared to be appropriate for this chapter to focus on metasystems transition perspective of instructional design. This chapter aims to understand the correlation between instructional design models and metasystems transition perspective. 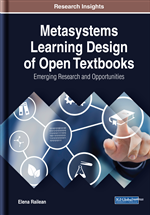 The book chapter concludes with solutions with recommendations for future research concerning the role of metasystems in learning theory and design. Open education has nurtured a new culture of planning, modeling, developing and sharing textbooks. The philosophy of open textbooks is based on UNESCO “Open Education for all” stated in the 60th and recently stated initiative of transformative OER. Open education is for the open society that is dynamic, transparent, transformative and flexible and has a critical attitude to values and traditions. The most important thing in open education refers to an instructional design that is “increasingly important in a number of technology-related fields” (Gibbons, Boling & Smith, 2014). The term “instructional design” refers to a systematic development of instructional specifications using learning and instructional theory. First predecessors of the instructional design models were highly complex man-machine systems that led to transfer to the design of Social Media and knowledge management systems. In time, “research on the design process has increased proportionally, and within the field of instructional design (ID) this research has tended to focus almost exclusively on the use of design models” (Gibbons, Boling & Smith, 2014, p. 607), but also is recognized the hierarchy of systems & levels, where learning-experience is the primary (system) level around which instruction is organized. Nowadays, the open education is a norm. Regardless of this important fact, the open education theory is still in its infancy. In what follows, we expand on this premise that open education goes beyond instructional systems design approach. For this, it is examined the differences between Cartesian view and social learning, as we provide answers to the following research questions: (1) What is the theoretical basis of instructional design models? and (2) What are the specific features of new instructional design theory? By highlighting most general concepts and similarities between instructional design theory and open education, the aim of this chapter is to complement existing literature and to clarify the effectiveness of instructional design models for open textbooks.